I found myself having to make one quickly for an apple day in 2012. 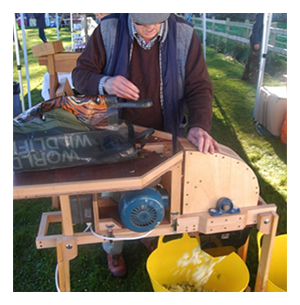 It had to be a powered machine which would sit alongside the press as a portable, safe and easy to use machine, and made from timber – because that’s what I do! Luckily I had been giving some thought to this and researched them for some time. •	Must be safe to use. •	Must be easy to assemble etc for cleaning as well as transportation. •	Must enable a suitable second hand electric motor (ie one of yours!) to be built into the machine – all-though new motors & switchgear can be supplied. •	Must produce a pomace fit for purpose, both from apples and pears at an acceptable rate. •	Design must enclose mill / rotor to achieve a compression action as well as avoiding splash-back and more importantly remain safe to use. 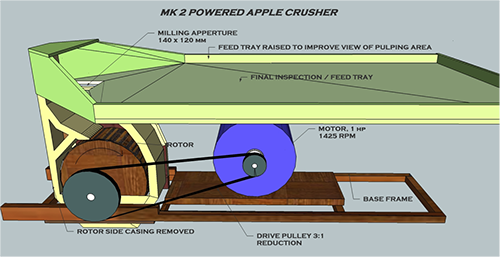 The heart of the machine is the rotor – specifically its overall dimensions, and the design of the cutting blade mechanism used to crush the fruit to an acceptable size. By a process of trial & error an optimum combination for crushing / slicing efficiency coupled with an acceptable work rate was achieved. A design innovation is an adjustable headspace between the outer face of the rotor and the inside of the housing. This will allow optimum maceration for fruits of different hardness, ie different varieties of apple or pear, and whether they are freshly picked or being pressed from storage. The feed system has also been designed primarily with safety in mind; and also to allow a final inspection of fruit prior to crushing. The legs (not shown on the schematic above) will be more substantial than those shown but still fold for ease of transport. Free height from ground to the exit chute will enable easy collection of pomace.